For many, Google Analytics 360 is a black box. Marketing and sales collateral from Google is spartan, and common refrains about key features—like unsampled data—seem unworthy of a six-figure bill for most sites. That disconnect exists because many, myself included, have understood Google Analytics 360 primarily as an expansion of the data caps we encounter with the free version. As it turns out, those caps represent a fraction of overall value—like differentiating a presidential suite from a standard room based on square footage. 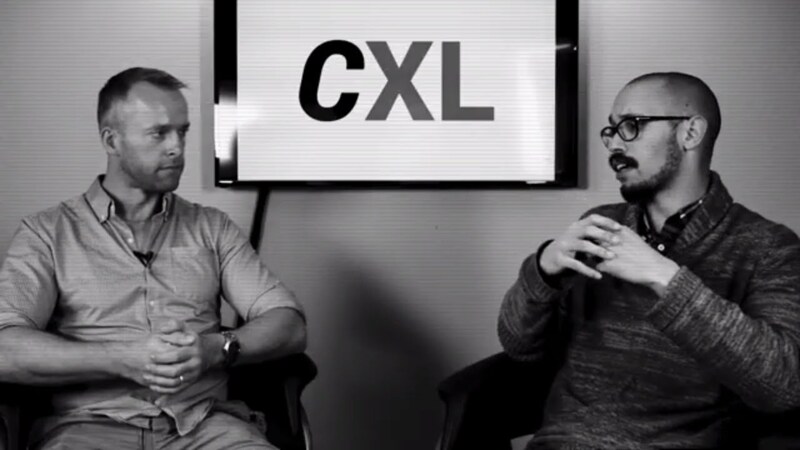 Charles Farina of Analytics Pros, who has used Google Analytics 360 for years, gave me an hour-long walkthrough of the platform to highlight the most meaningful differences: those that drive ROI. Some differences in functionality between 360 versions and their free counterparts are limited. Tag Manager 360, for example, touts “enterprise level support” as the primary benefit. 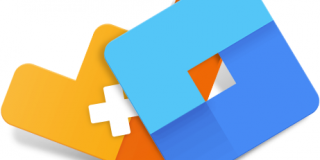 This post focuses on Analytics 360 and the integrations with other platform products that occur within the Google Analytics UI. Sampling. The free version of GA begins sampling data for non-default reports that exceed 500,000 sessions. GA360 doesn’t begin sampling data until reports exceed 100 million sessions. The free version also does not guarantee data processing above 10 million hits per month; the guarantee extends to 2 billion hits for GA360. Time lag. GA360 pushes all data into its reporting interface within four hours and often does so in a matter of minutes. That near-real-time data entry is faster than the free version, which usually takes a full day to process data. Export size. GA360 allows 3 million rows; the free version offers 50,000. Custom dimensions and metrics. GA360 offers 200 of each compared to the free version, which provides 20. Roll-up reporting. GA360 allows users to roll up reporting from multiple properties efficiently with capabilities not available in the free version—deduplicating users, stitching sessions, inheriting custom dimensions and metrics, etc. 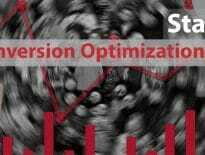 Data-driven attribution modeling. GA360 moves beyond the standard attribution models available in the free version and—using machine learning—creates custom attribution models with data from GA and connected accounts, including TV ad buys. A report showing weighted attribution in Attribution 360, which allows users to create custom attribution models for GA data. Connections between Google Analytics data and personally identifiable information. Integrations with a wider range of ad networks. Farina walked me through each. A platform change for that reason, it turns out, is unwarranted—if you take your GA data to the international waters of BigQuery. 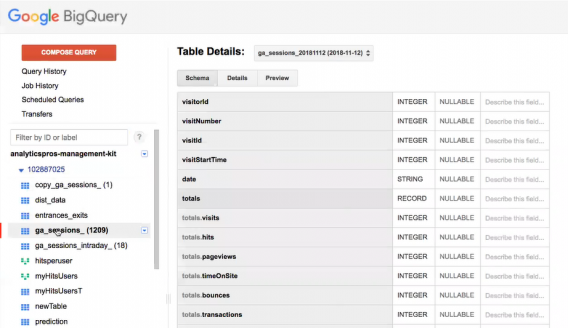 BigQuery, part of the Google Cloud Platform, is a fully managed data warehouse. Integrating GA data with BigQuery is possible only with GA360. BigQuery starts with 13 months of historical GA data, collecting new data indefinitely moving forward. BigQuery bridges the gap between anonymous GA IDs and CRM data. It is possible to export data from the free version of GA into another platform, but the process is incomplete and doesn’t scale: It relies on the GA API—a source of report data but not raw data—or a plugin, like the one for Google Sheets. BigQuery can join data in GA to a CRM via, for example, a hidden field in a contact form that passes the anonymous GA ID into a field tied to an individual ID in a CRM. As Farina detailed, some companies use BigQuery as their primary data warehouse; others treat BigQuery as a way station before passing data on (via export) to a preferred cloud storage system. Move Salesforce data from Sales Cloud into GA360 for attribution reports, bid optimization, and audience creation. Push GA360 data into the Salesforce Marketing Cloud reporting UI. Connect GA360 audiences to Salesforce Marketing Cloud for inclusion in Salesforce campaigns (e.g. email, SMS). Create audience lists from customer interactions in the Salesforce Marketing Cloud. Import Salesforce Sales Cloud user attributes, Einstein Lead Scoring, and ecommerce metrics into GA360. In another use case Farina suggested, companies could customize email content based on browsing behavior. If you manage a daily digest for The Seattle Times, for example, you could include more sports stories for sports junkies and more political headlines for partisans. The decision to integrate Salesforce with GA360, he continued, arose from the ongoing consolidation of martech stacks by Adobe: Adobe purchased Marketo in 2018, pressuring Google and Salesforce to offer a competitive alternative. Ad spend, rather than total traffic, may be the easiest way to justify a GA360 investment. If you’re currently spending $100,000 per month in Google Ads, Farina postulated, how much more efficient could you be with GA360? A 10% increase in efficiency would nearly cover the cost of GA360. Panasonic used GA360 to increase the return on advertising spend (ROAS) by 30%. Moncler’s GA360 investment delivered a 35% improvement to their ROAS. The free version of Google Analytics already includes robust (yet underused) integrations with Google Ads. As Farina highlighted, you can build segments based on a combination of conditions, then export that audience to Google Ads for remarketing. 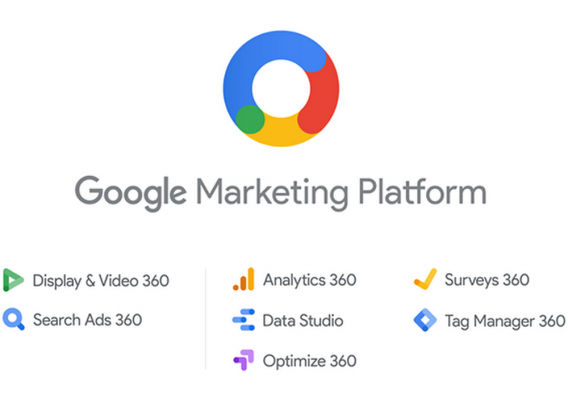 GA360 extends the capabilities available for Google Ads to other platforms and networks, like Campaign Manager, as well as non-Google networks, like Index Exchange, in Display & Video 360. 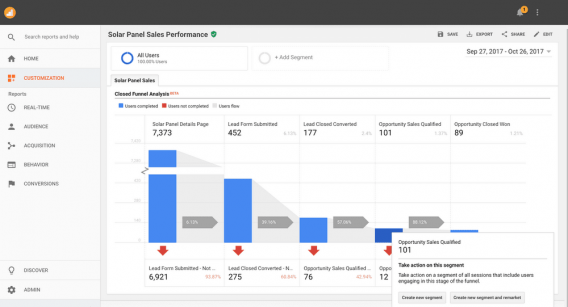 Display & Video 360 extends GA functionality for Google Ads to more ad networks. Because the data exists in BigQuery as well, audiences transition fluidly between anonymous Google Analytics users and known leads or customers in a CRM. Thus, the value of GA360 is not merely getting more granular data on ad impressions but attaching that data to real users for smarter retargeting or tailored email campaigns. Two high-value data visualizations are unique to GA360: Custom Funnels and Advanced Analysis. Building a useful funnel in the free version of Google Analytics, Farina conceded, is nearly impossible. In GA360, it’s simple—agonizingly so for those who have labored through funnel creation or analysis in the standard version. Custom Funnels are easy to create and simple to export as an audience or segment. Like other GA360 features, the primary benefit of Custom Funnels is not only visualizing user behavior but translating that visualization into action through export to a marketing automation platform. Advanced Analysis, still in Google’s beta purgatory, “sits very closely between Data Studio and Analytics,” according to Farina. Advanced Analysis combines elegant visualization with granular user information. A common refrain from Farina was that GA360 is an enterprise product—most users fail to max out the capabilities of the free version and wrongly assume that an unsampled report or limited export holds back analysis and growth. Extremely high-traffic sites. According to Quantcast, about 600 U.S. sites generate more than 1 million monthly visitors—enough so that a month’s worth of data is sampled below the 50% threshold. For those sites (and many with less traffic), an enterprise analytics tool is essential. Large B2B companies that already use Salesforce. The managed integration of Google Analytics and Salesforce data would likely cover the costs for any independent effort to bind analytics and CRM data. Companies with high ad spend. As noted earlier, a $100,000 monthly ad spend requires a 12.5% increase in efficiency to cover the cost of GA360. What about alternative analytics platforms like Heap, Segment, or similar options? Where do they fit into the analytics conversation? Even if you use Heap, it’s likely that Google Analytics is still a primary tool that marketing uses, where Heap might be something that the data science team starts to use more. And the challenge that we’ve seen again and again is that, at that point, you have two different data sets and two different implementations and two different sets of metrics and conversions. That can be a real challenge, especially when the data is not directional between platforms, and you get into this area where no one trusts it, no one is using it, and you’re not getting value out of either side. I asked Farina a final question: If Google is worried about competition from Adobe, why not just give away other 360 features for free? Or charge $100 per month? 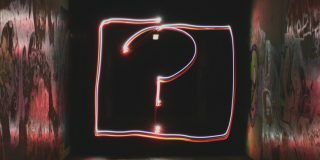 Some aspects of Google Analytics 360 are a clear drain on server resources, but others, like the ability to connect GA data to a CRM, could quickly undermine a primary selling point for Adobe. If you continually bump up against the data caps of the free version of Google Analytics, a switch to Google Analytics 360 may be necessary—even though the business case might remain murky. You’ll get more complete data, but how will you drive more revenue with it? 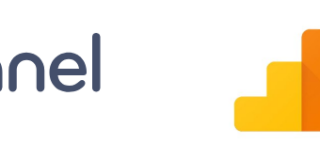 Using BigQuery to connect on-site behavior with individual users for targeting via marketing automation platforms. 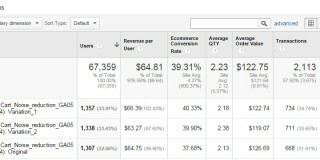 Exporting tailored audiences in Google Analytics back into ad platforms for smarter remarketing. Using integrated ad spend data to create more reliable attribution models that, in turn, dictate ad spend. Ultimately, Farina’s reference to the “user journey” applies to more than the analytics platform. It also includes overall marketing maturity: Even user-specific data or actionable attribution modeling will fail to deliver ROI unless those insights direct marketing efforts beyond analytics. Any suggestions on most relevant courses for programmatic traders? I’m not sure exactly what you’re looking for, Dmitrii. Any particular marketing challenges you’re working to solve? You may get some additional viewpoints by posting your question on our Facebook group: https://www.facebook.com/groups/conversionxl/. There are lots of super smart people answering questions there. Nice Article. Haven’t used Google 360. Reading this was really helpful for leveraging analytics features to help businesses.